Getting safer roads would mean more people feeling confident to cycle and use local amenities within walking distance. It would also cut carbon emissions as drivers would not be accelerating so much between the frequent stops that are made in urban journeys. 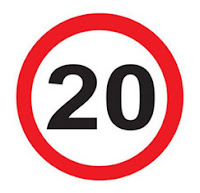 Several towns across the UK have already introduced these limits with very impressive results, but if we could get Birmingham, the UK’s second city to do it, that would be a great achievement. We still continue to campaign on better public transport, too, but this seems a vitally important first step to bringing about the (must use buzzword) modal shift in transport that’s required to make Birmingham greener.